Bill DeMain is not a newcomer in the scene, yet you will not have heard his name as a solo artist so far. As part of “Swan Dive” DeMain recorded already nine albums but recently he recorded this solo EP full of self-penned tunes as part of some therapy. Well it might sound strange, but it was indeed something he had to do to put his mind on ease. Recently his basement was flooded destroying 80% of all the material, notes and song texts he wrote over the years. A couple of months later his whole house was destroyed in a fire. So the only thing he could do to deal with that loss was to start working on new material and recording a solo album. On Extended Stay, DeMain comes with all kinds of tunes and atmospheres that are reminiscent to the biggest names around. St. Joe ’75 is a beautiful blend of Paul Simon & the beach boys, Raggedy Man feels like t comes from that hand of Nilsson on Common Love song one cannot help thinking about the wings. 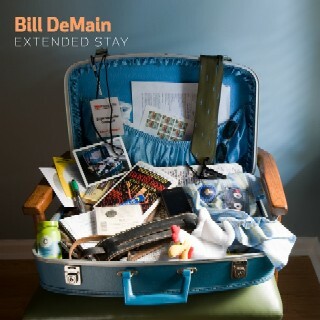 Extended Stay is a typical singer songwriter album like they used to make them years ago! One of those gems that we haven’t heard in a long time.